One of the best things about cooler temperatures? Trading in light summer salads for warm, filling platters of seasonal produce. 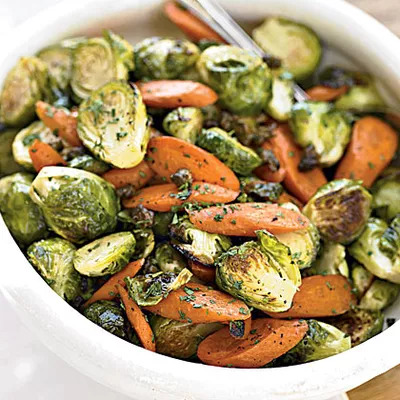 For your first veggie dish of the season, why not try this recipe for Roasted Brussels Sprouts with Crispy Capers and Carrots? Chopped parsley and capers give this classic vegetable combo a fresh twist. To make the capers ‘crispy’ simply simmer them over medium heat with butter and oil before adding them to the roasted carrots and brussels sprouts (bake for 15 minutes at 450 degrees). Sprinkle with salt and pepper to taste and you’re good to go. Rather than relegating these vegetables to side-dish status, serve them over a bed of salad greens for a light meal that satisfies on its own.